Browse the gallery above of “before and after” images. Ladder 1, an E-ONE Cyclone II, began service as Truck 4 with Rowlett (TX) Fire Rescue in 2004. In 2014, the truck was damaged in an accident. Although not heavily damaged, the truck still took a good hit to the right front of the cab. As the truck was 10 years into its service life, a decision had to be made to repair or replace the unit. Repair and refurbishment was decided upon. The cab damage on the right front was repaired, and the cab door was replaced as was the right front windshield. The frame was straightened and the interior cab was refurbished with new paint, new SCBA-style seating and a severe-duty dash. Two EMS cabinets were installed over the wheel wells. The original stainless steel bumper was replaced with a heavy duty steel channeled bumper. This style bumper is designed to hold two 200-foot lays of 1¾-inch hose with two 1½-inch discharges installed during the refurbishment. Left-side roll-up doors were replaced with hinged doors. New chevron striping was added to the front bumper and the rear end of the truck. 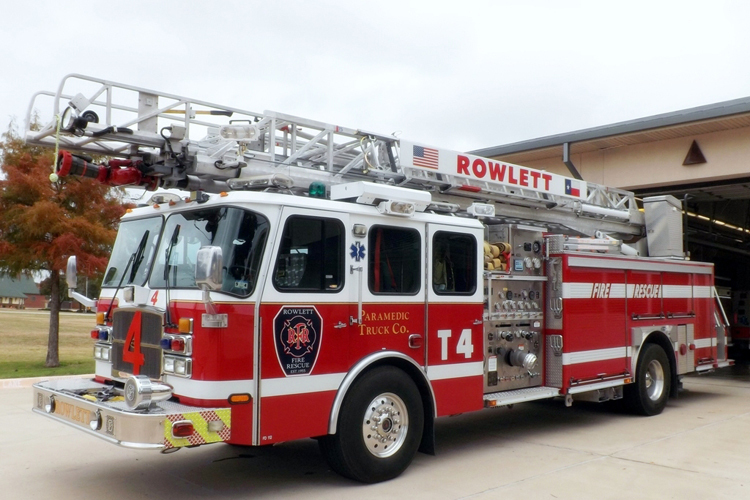 The entire apparatus was repainted in Rowlett’s new color scheme of solid red. An in-frame overhaul of the Detroit Diesel S60 engine was performed. All coolant, fuel system, and power steering hoses were replaced. The front axle assembly was replaced along with new front springs, pins, shackles, with new U-bolts. A new steering gear and steering assist cylinder were installed. The rear suspension was reconditioned along with replacement of springs, torque rods, U-bolts, and alignment of the rear axle. The rear axle brakes and drums were replaced along with the air system being upgraded. The air system upgrade includes a new air dryer, new brake and air system valves, new brake chambers, and new brake hoses. Heated auto drains and pull cables for drains will be added to the air tanks. The transmission was removed and replaced with a refurbished Allison HD4060P unit. The Hale Qmax pump (midship) was rebuilt with replacement of the impeller shaft and bearings/seals for the pump transmission. The seals were upgraded to mechanical seals. A Hannay booster reel with 100 feet of 1-inch hose was mounted on the upper right side of the body. The aerial (75-foot rear-mount) was tested for hardness and twist for acceptable tolerance prior to removal and disassembly. Ladder sections were checked for wear and acid washed and reswirled. The aerial hydraulic cylinders were removed and replaced with new cylinders along with hydraulic hoses in the base section and turntable being replaced. The ladder extension system was inspected and all cables, cable wear pads, load transfer pads, sheave wheel bearings, and pins were replaced. The turntable was inspected and adjusted as required. All spherical bearings on the turntable and ladder were replaced as were the control panel, man-saver bars and hand rails. The waterway drain valve and relief valve were replaced along with the electric monitor controls and battery. The warning lights were upgraded to LED style lights. Two Whelen Mini Freedom 24 inch light bars (Model FNMINI) were installed on the front corners of the cab and two Whelen Mini Freedom 24 inch light bars (Model FNMINI) were installed above the rear cab doors. An LED Roto-Ray was mounted on the front center of the cab above the grille. Whelen M6 LED lights were added to the perimeter of the cab and body. Two Whelen Model L31 beacons and Whelen Model B6LED lights were mounted on the rear of the body above the ladder tunnel. Scene lighting added includes two Fire Research Evolution lights mounted above the windshield and two mounted above the side canopy panels. Audio warning upgrades include two new Federal Dynamax ES100 speakers with “E-ONE” grilles, and a new fire bell was mounted on the right front bumper corner.